If timing is everything, then the Tanzanian striker couldn’t have timed the upsurge of his form in a better manner. 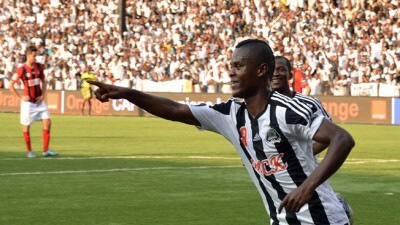 Indeed, the first half of the year started at a slow pace: it took Samatta until the last group stage against Maghrib Tetouan to register on the scoresheet in the African Champions League, scoring a 60-minute hat-trick as TP Mazembe’s attack finally established fluency. Prior to the hat-trick, some had interpreted the indifferent form as a sign of a striker who had outgrown TP Mazembe and had become stale. Others were more lenient, preferring the point of view that chances were not being created. In truth, it was probably a mixture of a player who hadn’t hit top form playing for a side which was experiencing creativity problems. A forceful, direct runner with the ball, with the explosive blend of pace, power and precision to destroy defences on his own, the 24-year-old’s ice-cool finishing would see him as the joint top scorer of the CL with seven goals to his name as TP Mazembe lifted the continental crown. The signs throughout the knockout stages were that of a player who was too good for the level he was playing at. For the Taifa Stars of Tanzania, he underlined his importance again despite the rise of club colleague Thomas Ulimwengu to ease the attacking workload. His fantastic goal against Algeria in Tanzania’s 2-2 draw, making a mockery of a defence playing at a good European standard, and general good performance, was the confirmation of a player who was ready for the big time. Genk, Nantes, and Olympique Marseille are currently involved in a tug-of-war for his signature. The former two would be ideal due to the lack of pressure to instantly perform, but the latter can’t be ruled out: Marseille has a proud history of providing a platform for some of the best African players to shine, and Samatta is currently one of the best Africa has to offer. Major awards can sometimes come down to popularity rather than quality, but CAF couldn’t have got the award wrong even if they tried. The recognition means Samatta can lay claim to being the most famous Tanzanian footballer of all time.